I only just met her. The other ladies I know have been helping her for awhile. Although Kim has cancer, this was bigger. It was about people, women, moms, families, coming together. Do we always need a reason? Maybe. If we have one does it make it easier to donate time, effort and items for a cause? Maybe. I am rarely tempted to donate money to organizations or individuals. I tend to be more local than global. Some may not agree with that, but I know for sure that I can do only what I can do. My first priority has to be my family. Anything I can do beyond that I’ll do. In this case, I not only wanted to help, I was compelled. That is much stronger word, and one I listen to when it comes from my gut. What I saw was an amazing collective of talents. A fashion show, bake sales, a petting zoo, food trucks, an auction and more. All under the hot sun on a beautiful California summer day. The birthday party before the park event was a great success as well, with live Star Wars characters there to help her four-year old boy celebrate in style. Light sabers for the kids, a very artistic cake and lots of yummy snacks and treats. A woman who was told she would not live to see this birthday was there with her trademark shining smile. The goose bumps rose on my arm as I watched her happiness burst out of every pore. Funds raised that day will help her medical expenses as she fights the ugly creature trying to stop her from seeing her son’s next birthday. 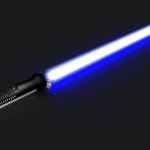 Star Wars seemed a fitting theme, plastic light sabers for the kids to battle the bogeyman, as we made a community light saber with our donations and time, and prepare to take collective aim at Kim’s cancer.